Quick post to share with you today...nothing unusual about that lately LOL!!! I was perusing my favorite challenges & came across the awesome sketch you see on my card from The Pink Elephant. I couldn't resist using it as well as the red, white & blue theme since I don't use that color combo very often. I am quite happy with how this card turned out though & hope it inspires you to stamp something pretty!!! Spectacular card! I LOVE the butterflies with the patriotic colors. Very pretty! 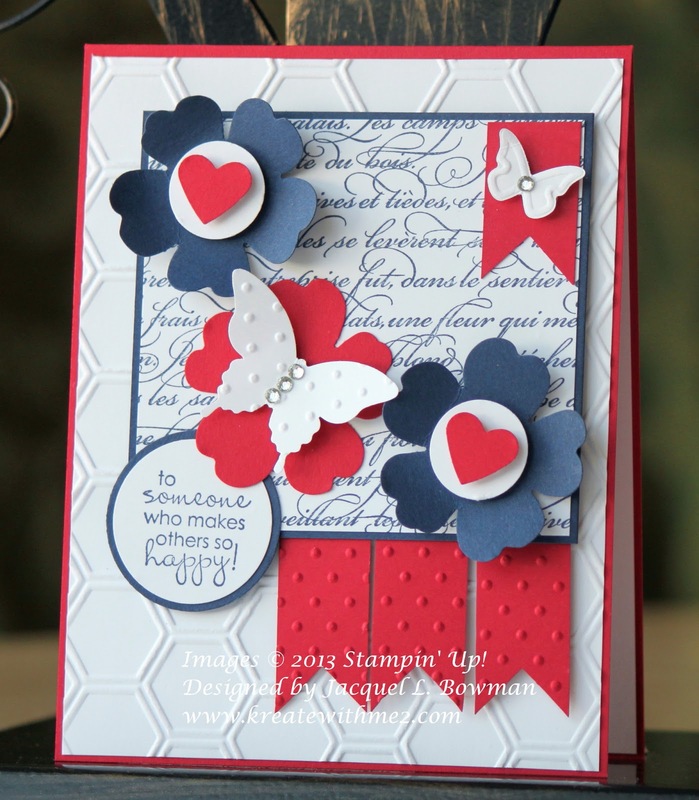 Great Red, White and Blue card, love the butterfly! Thanks for playing along this week over at CWLC Blog. I love your card. The flowers are simply elegant. Never can go wrong with butterflies. Thanks for joining our 4th of July (red, white and blue) Challenge at Created with Love Challenges. Wow love your red white and blue colors! Your card is perfect. Love the vibrant color choices! Gorgeous. Love the honeycomb combined with the polka dots. What a great card very creative, love the butterflies and the flowers!! Another cute and adorable card, love how you used the colors!!! Another in my fav's. Thanks for playing with us over at Loves Rubberstamps!!! Gorgeous card, I love all the dimension and texture you've got on it! This is stunning! This is super cute! What an awesome job! Thanks for playing along with the Get, Inky! Challenge! Perfect for the season! Beautiful! You rock with the red, white and blue color scheme - I see that you've made several beautiful cards with this color combination. I really like the layout of this card. The paper with script (stamped?) makes a great background for your die cut elements, and I like the detail of the banners too. Beautiful! Love the texture. Thank you so much for playing along with The Pink Elephant! Another fantastic red, white, and blue creation! !